Named 2017’s “Best Asian-Built Yacht” by Asia Boating Awards, the Majesty 155 provides supreme luxury and unmatched quality. From the ornately designed fountain on the sun deck, surrounded by a generous seating area, to an amazing waterfall that cascades from the rear sun deck into the Jacuzzi positioned on the upper deck, the Majesty 155 has a feature in every area. Unveiled in 2016, the Majesty 110 is the latest addition to the Majesty Yachts series of luxury fly-bridge motor yachts. A unique venture into the world of tri-deck and although only 33 metres in length, the Majesty 110 has been beautifully designed to offer ample interior space and great outdoor entertainment features. Crafted with freedom and lifestyle in mind, it can accommodate 14 guests and five on-board crew overnight in its spacious interior cabins. 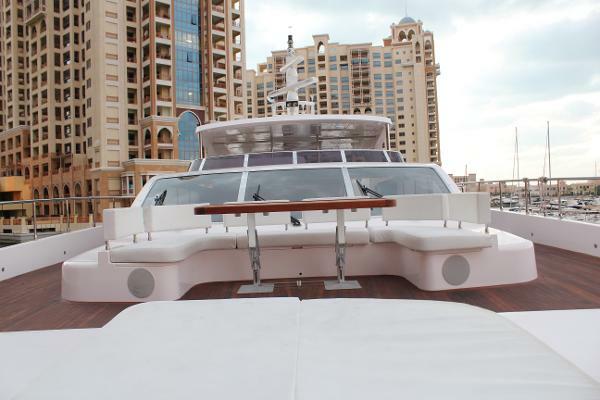 The Majesty 140 is a masterpiece created by Gulf Craft’s very own Design Studio. This project has redefined the meaning of superyacht by setting new standards in on-board space and entertainment features. It is indeed in a class of its own. The Majesty 62’s sleek profile conceals the skillful design of her decks, which include saloon and dining space, 4 guest cabins, 3 heads and separate accommodation for the crew. The fly-bridge is designed to maximize outside space making this the perfect choice for leisure cruising. The elegance of her design continues into the sleeping quarters, with the owner’s cabin being situated mid ship allowing large windows to bring the feel of light and space to the lower deck. Delivered in 2013, the 33-metre Superyacht MAJESTY YACHTS 105 is a splendid flybridge vessel, built by the premier Middle Eastern shipyard: Gulf Craft. Boasting a strikingly performant hull, the MAJESTY YACHTS 105 motor yacht represents both the highest degree of engineering, design and technological sophistication, as well as a highly innovative superyacht concept tailored to diverse cruising requirements. 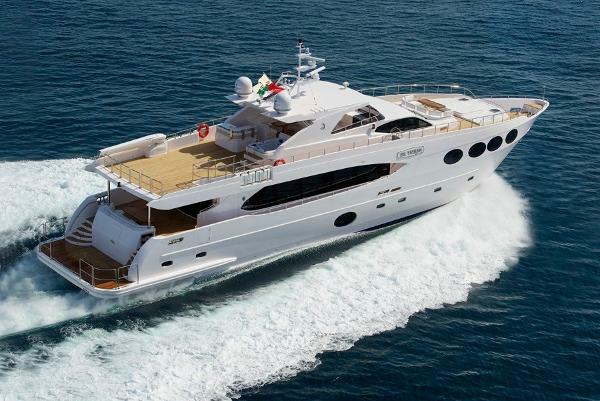 The superyacht boasts a vast flybridge and plenty of spacious exterior guest areas. Her bright and elegant interior has been designed in house and can accommodate up to 10 guests in 5 luxurious cabins. This beautiful vessel boasts a spacious owner’s stateroom on the main deck, 24 Guest cabins (2 doubles and 2 twins), 2 crew cabins and one captain’s cabin for a professional crew of 5, along with 8 bathrooms in addition to a day-head. This MAJESTY YACHTS 105 is a beautifully presented and maintained 33m Superyacht. Thanks to her twin Caterpillar C32 Acert engines, the MAJESTY YACHTS 105 is capable of a top speed of 26 knots and a cruising speed of 18 knots, with a range of 800 nm and representing the ideal Mediterranean large Motoryacht. Majesty Yachts are very much at the leading edge of yacht design and build, using sophisticated construction methods and excellent quality control. 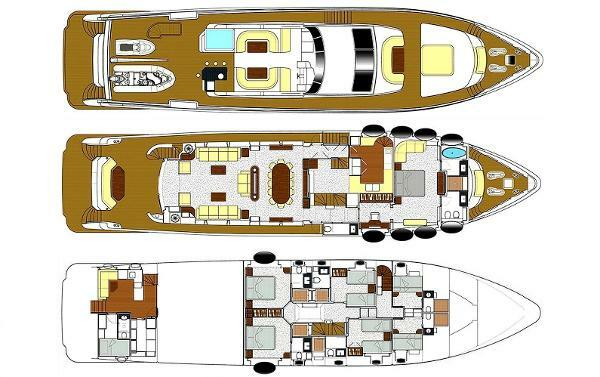 This is an opportunity to buy a first class Motor Yacht which is very competitively priced; not due to any compromise on the level of build quality but because of the relatively low cost of skilled craftsmen in the U.A.E. The Majesty Yachts team combines technical know-how, practical experience, and decades of steady investment to deliver personalized luxury without the price premium. Owners of Majesty Yachts enjoy luxury that’s meaningful, customization without the price premium, and performance-based sea keeping. The result is that Majesty owners are today cruising four continents with the confidence in a yard that’s committed to sustainably growing its market by selling its yachts, and offering unforgettable yachting experiences. Majesty Yachts relies on an in-house design team, as well as on Dutch, Italian, British and Australian designers, catering to diverse global tastes in exterior and interior styling. 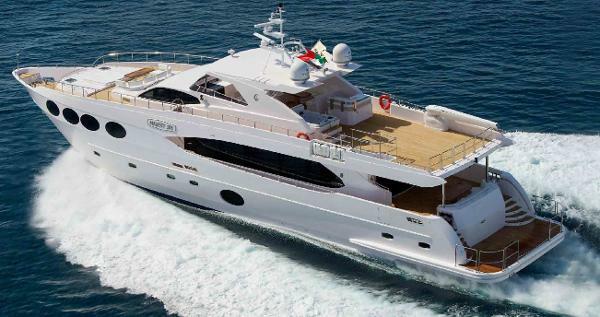 Please click on the « Full Specs » tab for complete details of this Flybridge Superyacht. 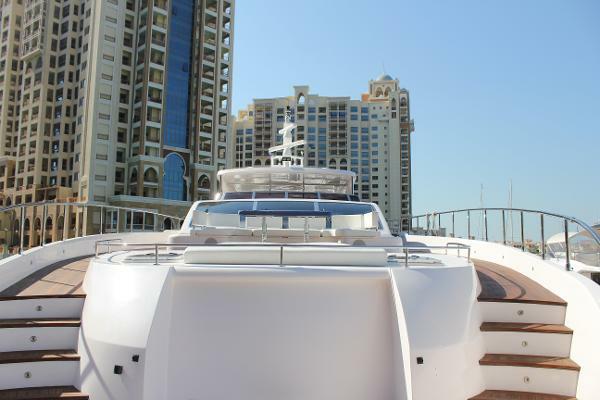 Gulf Craft launched its range of luxury fly-bridge yachts in 2004, and today features an innovative and extensive range of yachts from 44 feet to 135 feet. Majesty Yachts relies on a in-house design team, as well as on Dutch, Italian, British and Australian designers, catering to diverse global tastes in exterior styling and interior design. The Majesty Yachts team combines technical know-how, practical experience, and decades of steady investment to deliver personalized luxury and ensuring no compromise between luxury and safety. Owners of Majesty Yachts enjoy luxury that’s meaningful, customization without the price premium, and performance-based sea keeping. 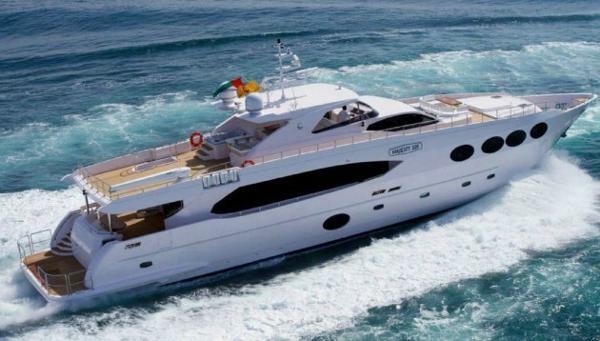 The result is that owners are today cruising four continents with the confidence in a yard that’s committed to offering unforgettable yachting experiences. With an unprecedented amount of topside deck for passenger enjoyment, the Majesty 48 is ideal for families wishing to comfortably entertain more than a dozen guests from its viewing decks. With abundant light, generous space and high-quality finishes, the panoramic main deck welcomes a saloon, dining and a galley. This yacht has been designed expressly for leisure cruising, making it the perfect choice for both holiday and weekend cruising as well as for entry-level yacht owners who would like to easily manage the fly-bridge yacht by themselves. The Majesty 77 is the perfect choice for family cruising or intimate social gatherings. As you step aboard its wooden deck and into the aft seating area in the cockpit, you will immediately be delighted with what it can offer as a luxury home at sea.